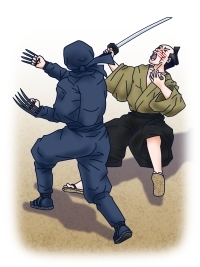 Ninjas scratched enemies sharply with " Tekko-Kagi"
One of the biggest differences between weapons of samurai and those of ninjas was that the former was made only for the purpose of killing a person, on the other hand, ninjas used many usual tools to fight with.
" 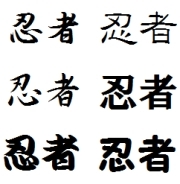 Tekko-Kagi (手甲鉤) " was very much in this category of usual tools. By nature, the origin of Tekko-Kagi was as a farm implement. It is a kind of a sickle used for reaping weeds. The speciality of ninjas was that they were able to use anything around them as a weapon. 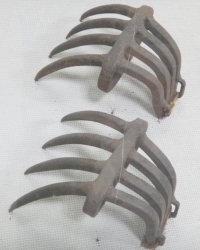 The shape of Tekko-Kagi was four iron nails like bear claws attached to a metal ring. When used, the ninja would grasp the oval ring and scratch his enemy with the edges. A rope was tied around Ninja's wrist tightly. Usually, a Ninja would wear Tekko-Kagi on both hands. There were two types of Tekko-Kagi. One is where the edges come on the back of the hand, the second was where the edges came on the palm. Tekko-Kagi was also a weapon for both offense and defense. Basically, Tekko-Kagi was used for an opponent who had some weapons. I want you to imagine the case where a samurai and a ninja are standing face to face. The samurai is taking a fighting stance with a samurai-sword, on the other hand, the ninja is ready to fight with the samurai, while holding Tekko-Kagi on both his hands. When the samurai is attacking the Ninja by swinging his sword, the Ninja lunges with his left Tekko-Kagi, and soon dives into the body of the samurai and rips the samurai with his right Tekko-Kagi. As the edge of the Tekko-Kagi is made of iron, the sharpness of it can be regarded to be almost as strong as that of wild animals like a tiger or a bear.